Chicken Divan is a delicious casserole consisting of a layer of broccoli, followed by boneless chicken breast and a thick creamy sauce topped with bread crumbs and grated Parmesan cheese. Chicken Divan is the most marvelous dish – great for special occasions or Sunday dinner. It’s one of those “all-in-one” meals covering the basic food groups: protein, veggie, even a little dairy. Served with rice pilaf on the side, it’ll become a family favorite. There is a little bit of preparation time involved, that’s why I prefer to serve it as a meal on the weekend. It reheats well so, make enough for leftovers the next night! Slightly cook broccoli in boiling water, till starting to get tender– but not quite done– drain and cool. Combine 2 cans cream of chicken soup, 1 cup mayonnaise (Hellman’s or any “real” mayonnaise—not salad dressing) 1 T lemon juice, 1 tsp curry powder. Spread over the chicken (thickly). 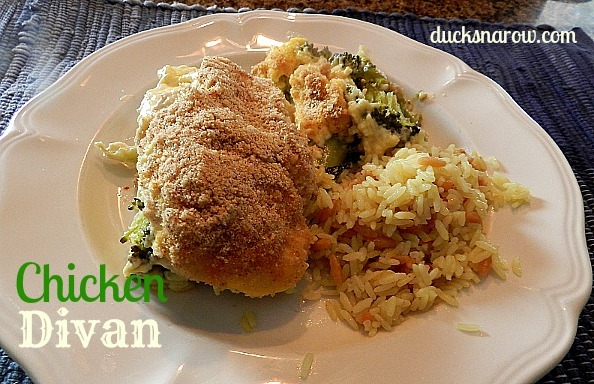 Sprinkle with a combination of bread crumbs (3/4 cup) and Parmesan cheese (1/2 cup). Bake in a preheated 350° oven, uncovered, for 60 minutes until done. I double this recipe, which increases the cooking time by quite a bit. Just cut into a piece to check for doneness. Serve with rice pilaf on the side.